A different look at Coron, a photo by nina_theevilone on Flickr. Finally made it back to Coron. After four years, the town has seen some addition of new concrete building (nothing too high), and an extended harbour. The ubiquitous zipline also makes an appearance. Still, the town still looks and feel the same. Even the drive to Maquinit Hot Springs is the rough and bumpy ride it was back then. Instead of doing the Coron island hopping tour, I opted for the farther Malcapuya, Banana and Bulog Islands. 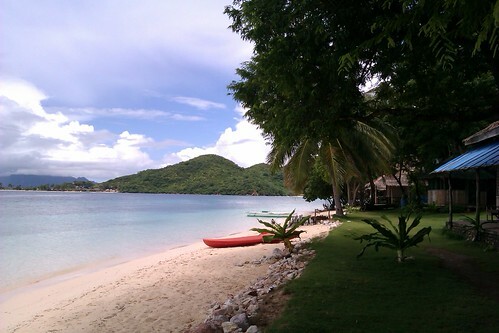 Coron may be a snorkelling and diving haven, but I have a preference for just chilling at the beach. It was also great to know that visitors have the option to camp there, as oppose to staying in town. Our accommodation is vastly different from where we stayed at before. Though staying n a cottage on stilts over the water is an experience you don’t easily forget, it’s also great to stay somewhere more comfortable and familiar. Not to mention having real doors in the toilet and running water. Coron is truly a haven. Very laid back esp yes, the Malcapuya ang Banana Island. I’ve never been to Bulog kasi the time we’re there, it was raining hard. But I believed, many who have been to Coron, would really like to return back…again and again. oooh! more details please! i only went to coron and the nearby islands. di na kami tumuloy sa banana and malcapuya kasi umuulan.is it true that one of the islands is already for sale? The last time I’ve been there ginagawa na ung nasa Bulog. Ang ganda pa naman sa Malcapuya. For sure if may resort na dun, magiging mahal na! Wow! It is indeed a very beautiful post. I am really glad that you shared this page. Thanks a lot for the share. real doors! haha.. when i showed that place to my gf, sabi nya ako na lang daw pumunta mag isa haha. Yup, that’s what I’d love to do in the future too! Hopefully before they start building in Malcapuya. Our boatman told us that someone already bought the island. Oops, didn’t ask about that! I haven’t been to Coron for many years now but coming across this post has just reminded me how much I love it there. Must try and get back next year for a visit! I stayed in Banana Island for two nights. Super bait ng mga tao dun. Haay. I miss that place already. I really hope wag maging super commercialized yung area. I mean sana payapa pa rin a few years from now. Looks like a beautiful area. I haven’t been lucky enough to visit this area yet, but i hope to do so in a few years time! I’ve always wanted to visit the Philippines, especially its beautiful beaches, like Coron! Thank you for this post.